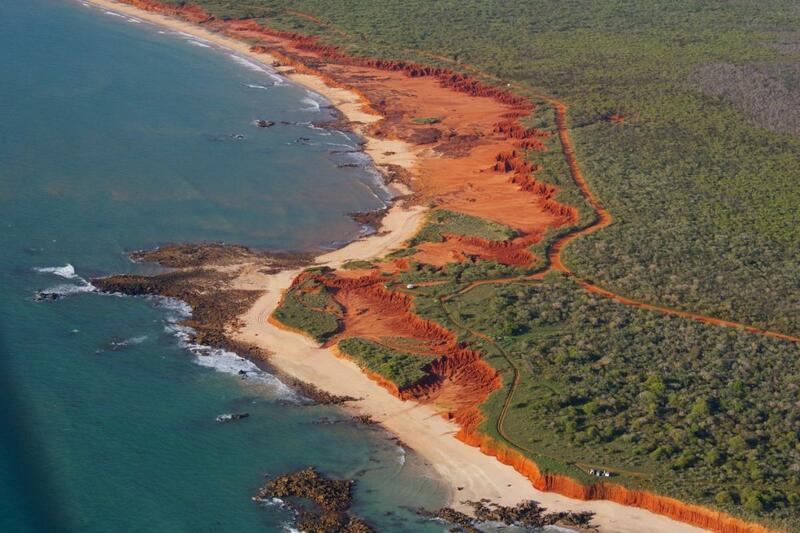 Walmadany (James Price Point) is located 40km north of Broome. It is a spectacular place that is in danger of being destroyed by the Woodside/Barnett Government proposal to build one of the world’s largest liquefied natural gas plants to process Browse Basin gas and condensate. The State Government and Woodside had identified Walmadany as the preferred location for the Browse LNG Processing Precinct. The precinct would occupy 1,000 hectares of sea and 2,500 hectare area of land. If built, it would increase Broome’s population by 6,000 workers, putting pressure on the town’s infrastructure and threatening existing industries such as tourism and pearling. The 180 metre flare tower at the processing plant would light up the night sky and would be seen from 30 kilometres away. 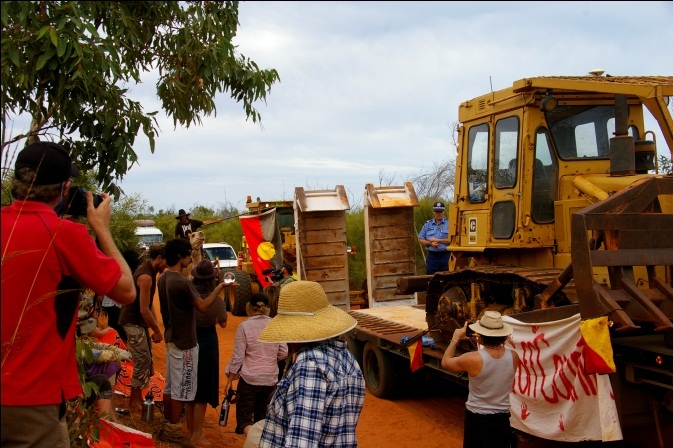 However, the local Goolarabooloo people staged fierce opposition to the development and camped on site for many months, educating workers and the public about the significance of the land in a fierce campaign to save the environmentally delicate area and its Aboriginal burial grounds. In April 2013, Woodside abandoned the development of James Price Point in favour of a floating gas factory. The company estimated the capital cost to be around $80billion which was simply not commercial. In August the WA Chief justice, Wayne Martin, delivered a damning verdict on the WA environmental approval process and ruled the environmental approval for the development to be ‘illegal’[i]. In September, in an attempt to arm-twist Woodside into building the supply base, Barnett threatened to withhold the state-owned parts of the Browse gasfields, worth between 5 and 15 per cent of the $40 billion project. In November 2013 West Australian government compulsorily acquired James Price Point, hoping to convince Woodside to build a $2 billion supply base to its Browse Basin Floating Liquefied Natural Gas (FLNG) ship. Failing that, the government plans for the land to be used as processing hub for the Kimberley's other ''world-class'' gas fields. Woodside and its partner Royal Dutch Shell are now working on the design process of the FLNG which is expected to be completed in 2014. It is understood the massive floating liquefied natural gas facility will require some sort of onshore base, thankfully James Price Point is not an economic option for this facility. Like many indigenous communities caught up in Australia's mining boom, the traditional owners were split over the gas hub against the backdrop of an extraordinary amount of money: $1.5 billion in benefits to the indigenous communities over 30 years. In what was to be one of the nation's most lucrative native title deals, almost $26 million was handed over but, following its decision to move offshore, Woodside has said it won't pay the rest of the $1.5 billion. Barnett's acquisition of the land comes with a $30 million payment, but it will be frozen in a trust until a native title dispute is settled. The ‘develop at any cost’ mentality of the WA government is not in the best interest of the region. The usual industry claim is that they create local flow-on employment. However, as is evidenced elsewhere, the proposed fly-in, fly-out workforce will not spend its income in those communities closest to the development. They will take it with them to wherever they and their families live. Walmadany (James Price Point) has to retain its beauty, the Greens will continue to oppose any industrial development on the site. In its natural state it has significant value: twenty metre high pindan cliffs fall dramatically to the white beach sand and turquoise waters below. The land supports countless birds, reptiles and mammals including the critically endangered Bilby. A narrow strip of monsoon vine thickets separates the pindan vegetation from the beach. This freshwater sink maintains plant life critical to the survival of many species and contains bush medicine and bush tucker that has sustained local people for millenia. The near shore reef is home to a mass of life, from corals and algae, oysters and clam shells to deadly octopus and many varieties of fish. Nesting turtles visit the area and Humpback whales can be seen during their migration to calving grounds a little further north. Walmadany is home to the Jabirr Jabirr and Goolarabooloo people. Shell middens all along the coast attest to the many thousands of years of traditional occupation. The place is named after Walmadany, a powerful maban (healer, magic man) and leader who lived at the beginning of the 20th century and fought to protect his people and the land from intruders. For the past 20 years, the Goolarabooloo have led family and the public on an 84-kilometre coastal walk north from Broome called the Lurujarri Trail. The walk goes through James Price Point and follows traditional songlines (stories about the proper way to be in country, physical landmarks and the creation of the landscape and its people). The Goolarabooloo normally run one trail annually; in 2013 due to the interest in the landscape sparked by the anti-Woodside campaign, they ran four [ii]. James Price Point is also of great interest to palaeontologists who say it contains some of the world’s rarest examples of dinosaur tracks. 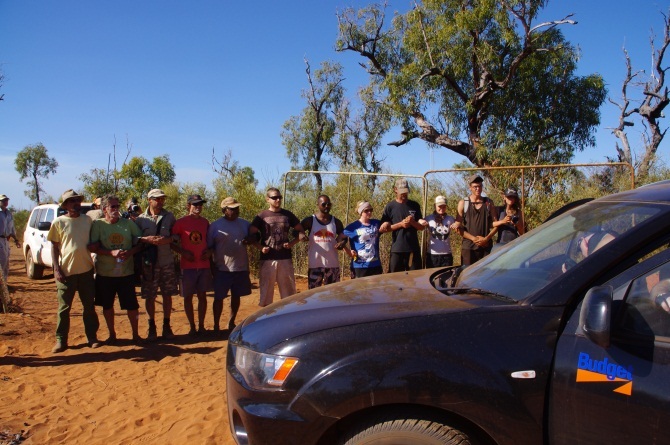 Members of the Broome community and tourists visit the area to fish and camp. Community groups hold regular clean-up-days to remove rubbish and weeds from the area and conduct nature surveys.